The gurus of writing, as well as text-improving apps, with one voice advise to simplify sentences, get rid of complex ones, and break monolithic ideas into small, monotonous phrases of 5-7 words. Text simplifiers forget how beautiful a sentence may be when filled with punctuation marks, aimed at helping a reader to hear the intonation of an author. Long sentences can be concise, though only if you skillfully place commas, dashes, colons, and semicolons in it. They help your reader slow down, speed up, and avoid the need to reread the same sentence in vain attempts to understand what it is about, and if there is any sense in it at all. In this article, when giving examples of semicolons and colons, we will cite the first chapter of “The Hobbit” by J.R.R. Tolkien. We decided to avoid unrealistic sentences composed for academic purposes only, as they can’t demonstrate the variety of applications a colon and a semicolon might have. We chose Tolkien, as his academic level leaves no doubts concerning the purity of his language; his sentences are long, his composition structure is complex, whilst his voice is bright, and his novels are spellbinding. A semicolon is a comma crossed with a period. This half-half status is what makes it so mighty. Though a semicolon can add comprehension and style, and make your text more concise, clear, and strong, the problem with it is there are no situations when you are obliged to put it, and can’t replace it with a full stop. There are only three situations when to use a semicolon. A semicolon is applied to simplify complex lists. It separates items in a list where there are already a lot of commas. e.g. : They are inclined to be fat in the stomach; they dress in bright colours (chiefly green and yellow); wear no shoes, because their feet grow natural leathery soles and thick warm brown hair like the stuff on their heads (which is curly); have long clever brown fingers, good-natured faces, and laugh deep fruity laughs (especially after dinner, which they have twice a day when they can get it). 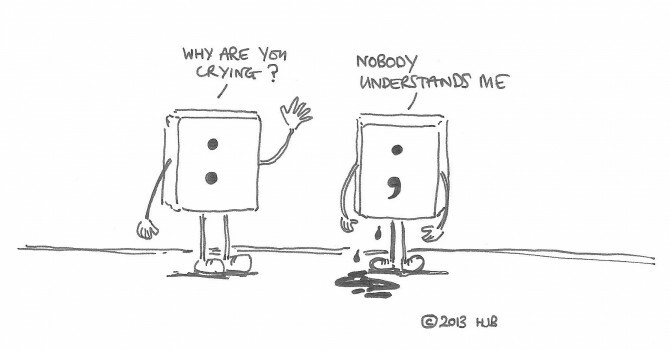 A semicolon can also link two simple but complete sentences together. Such sentences are closely related, but one must not be a direct explanation of the other. The independent clauses (simple sentences) can be connected by a transitional phrase, a conjunctive adverb, or a coordinating conjunction. To be sure you’ve applied a semicolon right, replace it with a full stop for a moment. Are the short sentences you get from a long one grammatically correct? Do they make sense when they are on their own? Then press ctrl+z and change the full stops back into precious semicolons. e.g. : Some called for ale, and some for porter, and one for coffee, and all of them for cakes; so the hobbit was kept very busy for a while. e.g. : The dark came into the room from the little window that opened in the side of The Hill; the firelight flickered—it was April—and still they played on, while the shadow of Gandalf’s beard wagged against the wall. e.g. : Kili and Fili rushed for their bags and brought back little fiddles; Dori, Nori, and Ori brought out flutes from somewhere inside their coats; Bombur produced a drum from the hall; Bifur and Bofur went out too, and came back with clarinets that they had left among the walking-sticks. There is a belief that depending on a conjunction, we use either a comma or a semicolon before it. Conjunctions preceded by a semicolon: however, consequently, thus, therefore, meanwhile, and nevertheless. Conjunctions preceded by a comma: and, while, nor, but, for, or, yet, so. e.g. : He shuddered; and very quickly he was plain Mr. Baggins of Bag-End, Under-Hill, again. e.g. : I tried to find one; but warriors are busy fighting one another in distant lands, and in this neighbourhood heroes are scarce, or simply not to be found. e.g. : The dwarves rushed out of their great gate; but there was the dragon waiting for them. The above-mentioned examples help us grasp the third case when a semicolon can be applied, and that is if an author feels it will express the style or tone of the text. This last remark ruins the concise rules concerning the semicolon, making it again, as it always was, a potent, though not simple punctuation mark in the English language. When to use a colon? A colon is not as neglected by English-language students as a semicolon, as there are direct and strict rules of its usage. First of all, a colon introduces lists. e.g. : No going upstairs for the hobbit: bedrooms, bathrooms, cellars, pantries (lots of these), wardrobes (he had whole rooms devoted to clothes), kitchens, dining-rooms, all were on the same floor, and indeed on the same passage. It makes an announcement and introduces things. e.g. : The door opened on to a tube-shaped hall like a tunnel: a very comfortable tunnel without smoke, with panelled walls, and floors tiled and carpeted, provided with polished chairs, and lots and lots of pegs for hats and coats—the hobbit was fond of visitors. It is used in quotations (sometimes we can use a comma instead though). It gives an introduction or elaboration of what was before it. e.g. : I like six eggs with my ham, when starting on a journey: fried not poached, and mind you don’t break ’em. e.g. : Not a nasty, dirty, wet hole, filled with the ends of worms and an oozy smell, nor yet a dry, bare, sandy hole with nothing in it to sit down on or to eat: it was a hobbit-hole, and that means comfort. e.g. : The Bagginses had lived in the neighbourhood of The Hill for time out of mind, and people considered them very respectable, not only because most of them were rich, but also because they never had any adventures or did anything unexpected: you could tell what a Baggins would say on any question without the bother of asking him. It isolates words in order to create an emphasis when the right clause is incomplete, and one clause explains the other. This kind of emphasis was not in Tolkien’s style, so let us give you an example of our own. e.g. : There was only one thing he liked about her: her smile. in titles (e.g. : Punctuation: Semicolon vs Colon). Using proper punctuation is a subtle art. It makes an English text look good on paper, and makes your writing sound like music. Punctuation helps the reader to hear the author’s voice; if yours still sounds insecure, put more emphasis on the meaning and the words in your writing, as Ian Fleming, and Ernest Hemingway used to. If your text is full of ideas, unable to fit into small sentences, you will have to comprehend the charm and strength of punctuation marks. And we assure you: colons and semicolons are some of the most understandable representatives of English punctuation. Appraise them, and remember that to start breaking the rules as enchantingly as Tolkien used to, first you have to get a degree in linguistics, as he did.